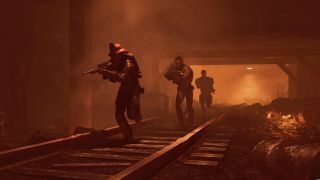 Fallout 76's anti-griefing should ensure a good singleplayer experience, but what about PvP? At QuakeCon this past weekend, Bethesda's Todd Howard explained how griefers will become part of the experience in the upcoming online spin-off Fallout 76. "We turn the assholes into interesting content," is how he put it. If you kill another player but they didn't want to fight, a bounty gets put on you, taken out of your own caps. You're marked with a red star on other players' maps, too, and you can no longer see other players on your own map who are presumably looking to put a bullet in you. It's a death sentence, by the sounds of it—if a potentially exciting, nerve-wracking one. That's not the only measure in place to protect players from griefing, either. You can ignore or block griefers, plus each encounter begins with a low-damage shot, likened to a slap in a bar. At this point, players can decide to participate in the fight or not. These touches sound very much geared towards people who want a traditional Fallout game, who were maybe wary of human interaction. This was a wise moment to drop this information: two months ahead of the beta, when people might be thinking about pre-ordering, and right after the publisher revealed that the game won't launch on Steam. To me, they sound like sensible answers to the questions we've had about griefing since E3. If Fallout is to become a multiplayer game and bring its existing fans along with it, while still backing up this promise to function as a singleplayer game, it has to prevent a nuke-happy free-for-all. It sounds like Bethesda spent a lot of time figuring out how best to do that. This made me think about the challenges of turning a traditionally singleplayer game into an online experience. GTA Online comes to mind as a comparison: it's not quite an MMO, but it is a 'live' game where players co-exist in an open world, performing tasks that wouldn't be out of place in a singleplayer version of that game. It doesn't have permadeath, but there are consequences if you're killed. And the experience of being in a public server in GTA is a mixed one, to the point where finding an empty one can feel like striking gold. When other players are performing, say, a drug delivery job, you're encouraged by the game to disrupt it for rewards. Above, you can see me about to blow up someone's promotional hot air balloon, and GTA telling me I can do so. It could be argued that this reflects the chaotic nature of GTA in an online setting, and that the possibility of player encounters add tension to the world. And it does, to some degree. You can also put bounties on players who have wronged you, out of your own pocket. But it's also pretty defeating to invest a bunch of time in something that a player could easily ruin while you're in a vulnerable position. That's not how I want to play a Fallout game. Fallout 76's anti-griefing instead sounds like it'll create the opposite kind of experience, where you'll have to think hard about the fights you pick. If Fallout 76 has strict-ish anti-griefing measures, then, how will that affect PvP? Will players just stick to their routes through the world, gesturing politely at strangers then being on their way, if there's no incentive to force a battle? I don't think griefers will be entirely deterred by these countermeasures, honestly. As Howard says, "So there is no reward, you get no caps, you get no XP, you get nothing for becoming a wanted murderer except for the kind of social incentives people have online to be assholes." Those social incentives will be enough for some people, I'm sure. Even if it's a punishing system, the idea of a griefer becoming an in-game 'event' will be exciting enough to some players—seeing how long a player can survive in these circumstances might become its own challenge. But griefing aside, I also think players will still initiate plenty of fair fights in Fallout 76, whether they're playing solo or in a group, and not just for the cap or experience rewards. Part of Fallout 76's promise to me is the inherent strangeness and tension of encountering other human players in a Fallout world. If anything, these systems seem designed to make you think harder about who you pick a fight with, whether you actually want to, and what it means when another player appears on the horizon. That's where the combination of Fallout and survival games begins to sound appealing. As players, we go in search of stories in Bethesda's games, whether they're scripted sidequests, random encounters with raiders, or a battle with a larger enemy, like a deathclaw, that you barely overcome with the last of your pistol ammo. In Fallout 76, you'll have a world that's four times bigger than that of Fallout 4, containing around 24 to 32 players. In theory, encountering others shouldn't be that common, even if you will be able to see other players on the map. I like the idea that when I'm travelling the world alone, I could encounter another solo player in an abandoned theme park, and decide to make that a Wild West-style duel. That, to me, could make a terrific story. But I wouldn't want every story to be like that, which is why I think these anti-griefing systems seem well thought out. They'll hopefully offer a level of control that should let singleplayer-minded Fallout fans feel more at home. Now I'm curious to see how the rest of the game, including quests and story, will support solo-focused play.